First introduced in 1984, the LEEP System was the long-awaited solution to the problem of "stereo window". Using the special stereographs produced only in the LEEP camera, the LEEP viewer with its very large lenses presents to the eyes a life-size, extremely wide angle recreation of reality. One "looks around" the scene, up, down and to the side, slowly taking in all in just as if returned to the original site. The enormous depth of field completes the illusion. Life-size close-up portraits and pictures of tall buildings are possible for the first time — and there is never distortion or error in perspective. Taken during the summer of 1979, this is the first complete LEEP stereo photograph ever made. For a long time, it was the only LEEP photo in existence. This particular slide is a picture of Eric Howlett, the inventor of the LEEP Panoramic Stereo Photography System. Eric made this first slide before he filed the patent application and before he publicly disclosed the invention. The first public demonstration was in March 1980 at the Photographic Society of America conference in Las Vegas. The picture in the demonstration viewer that he carried around the conference was exactly this image, except of course, in color and of a higher resolution. He took the photo with a Speed Graphic carrying a specially made lens board with two lenses 2.5 inches apart. Because a 4" x 5" sheet of Kodachrome wasn't quite wide enough, he mounted the lenses at an angle matching the diagonal of the film and then he tilted the camera by the same angle. The lenses were two glass elements for each eye off the shelf at Edmund Scientific. To take the shot, he stood at about arm's length in front of the camera. Observe that his left arm is reaching out to the side of the camera to press the cable release of the focal plane shutter. Strangely, there was too little lateral chromatism (not visible at all in the black and white) in this first image for it to be the the best match for the opposite lateral chromatism of the eventual viewer lens design. The molded plastic lenses designed for the LEEP cameras provided the necessary greater chromatism. However the angular (fisheye) compression of the image is just about exactly right. Above: From the first roll of LEEP pictures of weightless people. Recognizable in addition to Canadian payload specialists Kenneth Money, Ph.D. and Roberta Bondar, M.D. (who is giving Dr. Money a one-arm press) is NASA photographer Bob Gray. Below: The first LEEP picture taken by a weightless LEEP Camera. Dr. Oman is reaching for a pocket tape recorder. To his right is Millie Hughes-Fulford, Payload Specialist for Spacelab IV; to his left is Bill Williams; above (or below!) and partly hidden, is Byron Lichtenberg, Sc.D., who was a Payload Specialist on Spacelab I in November 1983. These LEEP shots were taken by Dr. Charles Oman, Associate Director of the M.I.T. Man Vehicle Laboratory, for an investigation of the role of visual cues in space orientation. 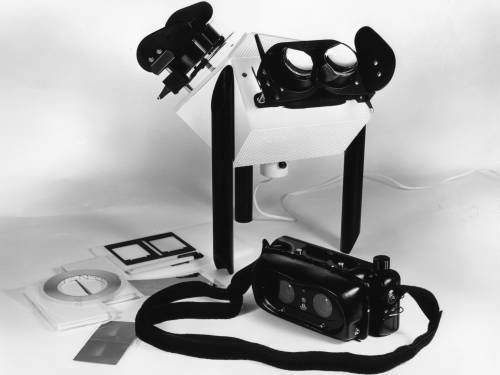 The LEEP camera and viewer were "judged essential" to the experiments because of the life-sized depth and naturally wide peripheral field they provide. The shots were made in weightless periods of experimental flights of a KC135 tanker jet. During the parabolic arc of these flights, periods of weightlessness from 15 to 20 seconds are achieved, permitting a variety of useful experiments to be performed. We selected these playful poses from 100 or so preliminary exposures designed to verify the usefulness of the LEEP system. A proposed long range program included carrying both the LEEP camera and the LEEP viewer on the space shuttle orbiter. LEEP pictures could be made in space and viewed in space, and also on the ground, in order to study the various visual cues involved in deciding, for example, whether the earth is below us or above us, and if we are sick about it or not. For a nineteenth-century view of a twentieth-century stunt, print out the stereo pairs, cut them out, and use with your Holmes Stereoscope. Without the powerful LEEP viewer, the scene is greatly miniaturized and highly distorted, but the sense of weightlessness is still quite keen. The color correcting fringes are, of course, not visible in this black-and-white reproduction, which is slightly smaller than the mounted original with 62mm infinity spacing.